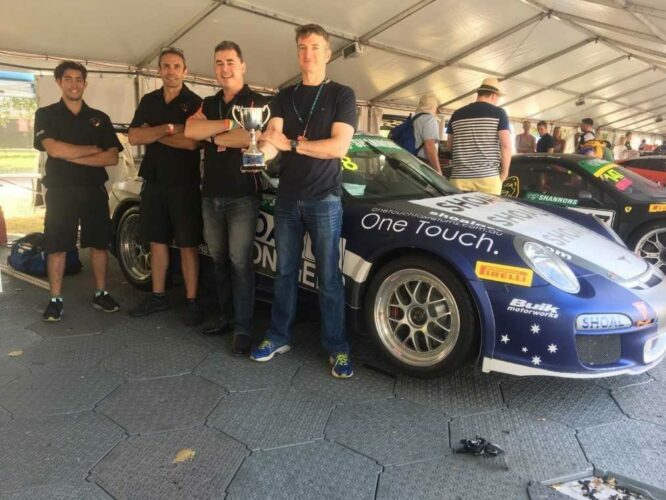 After returning to the Clipsal 500 in Adelaide earlier in the month, the Shoal/Thomson Geer Porsche was offered an entry into the Melbourne F1 Grand Prix in the Invitational Trophy Division of the Australian GT competition. The fast corners of the Albert Park track are very much suited to the power, handling and aerodynamics of the Porsche 997.2 GT3. To boot, the race included other Invitational Trophy cars, and hence the weekend promised some exciting tussles. In practice and qualifying, the car suffered from front brake lockups from inconsistent heat transfer through the front pads. This saw several minor expeditions into the kitty-litter. In the races, driver, Michael O’Donnell, managed to dodge plenty of crashes and incidents, but as predicted the Porsche struggled to keep up with better cars. In the end, the team finished undamaged and third overall in the Invitational Trophy Division.